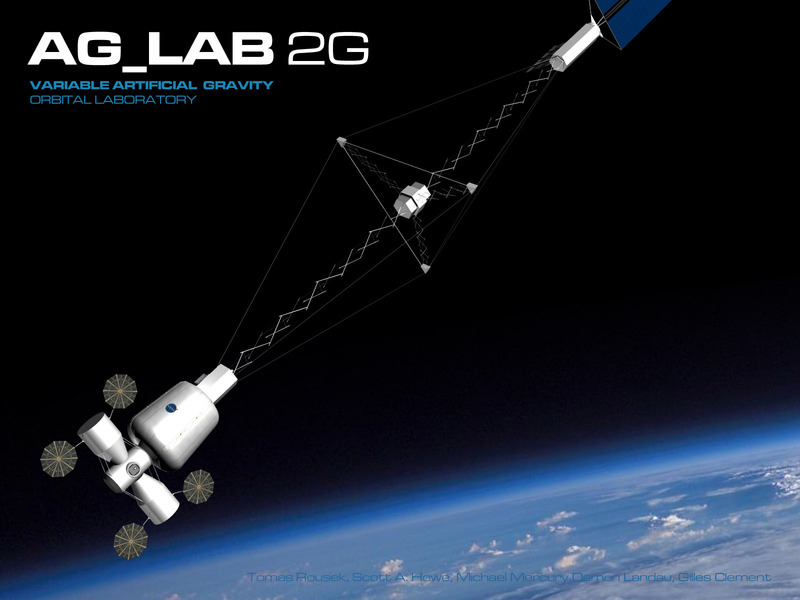 AG_LAB is the project of variable artificial gravity research station in Low Earth Orbit. The purpose of the station is to investigate the various gravity parameters and habitability in environment influenced by Coriolis force. The first generation uses tether system and radial orientation of habitation module while AG_LAB 2G is Mars transit vehicle precursor with tensegrity truss boom and radial orientation. Second generation of AG_LAB, AG_LAB 2G, is a precursor mission to Mars exploration mission. The structure is based on the lightweight deployable tensegrity truss boom (Figure 19) and vertically orientated modules. The prestressed tensegrity structure enables significant prolongation with variable length at very small weight. The principle of tensegrity is the ballance of tension and pressure elements in the structure that consists of carbon rods with kevlar strings. Additional tethers provide further stabilization of the truss boom against deformation to side. The variable artificial gravity research station would be important contribution and test bed for development of next generations of artificial gravity vehicles for long 21 exploratory missions. The negative factor is the cost, especially under current trend to get beyond the LEO orbit where the human space program stayed for decades. The future iterations of AG_LAB based on heavy-lift vehicle could use large inflatable volumes with rigid floor and free internal space to allow flexible interior outfitting in the similar manner to lofts; such facility would be real architectural laboratory. Then there would be possible to build interior elements with variable orientations and layouts to test them and discover best solutions for AG interiors.